Heathrow’s Terminal 5 offers a surprising example of reputational disaster turned to advantage. Out of all the most recent reputation crises to hit British businesses, the on-going IT debacle at TSB stands out as the longest-running and most complex to unravel. But how can the reputational cost of this disaster be quantified? And more crucially, how can brands recover from the kind of onslaught the champion of local banking has been exposed to? Let’s start with understanding the magnitude of the situation. Clearly, TSB has been hit hard. When an IT migration failed over eight weeks ago, more than half the bank’s customers were unable to transact. Small businesses lost the ability to pay staff and suppliers, and heart-breaking stories emerged of customers losing out on life-defining purchases like wedding day payments. TSB waived £10m in fees and even more in extra interest payments to avoid haemorrhaging customers in the wake of the issues. Until this point, the failure was clearly a case of a competency-based reputation crisis, as opposed to an issue driven by TSB’s behaviours or values. And it was especially sensitive as it affected the financial well-being of consumers. When a reputational issue hurts us either physically or financially, it tends to live much longer in the minds of the general public. The crisis was then compounded by very slow customer service response times, and the opportunity for fraudsters to exploit the situation and steal thousands of pounds of customer funds. CEO Paul Pester’s subsequent two appearances in front of the Treasury Select Committee, where his original testimony was called into question, moved the crisis into the realm of behaviour as well as competency. Real-time reputation tracking that measures consumer perceptions of TSB shows the brand in a vulnerable position. Over the preceding 30 days, brand and reputation consultancy Caliber Groupreported last week that TSB’s reputation has sunk to 55 on a 0 – 100 scale. This score places TSB at the bottom of all retail banks measured, performing as poorly as perennial whipping boy, Royal Bank of Scotland. 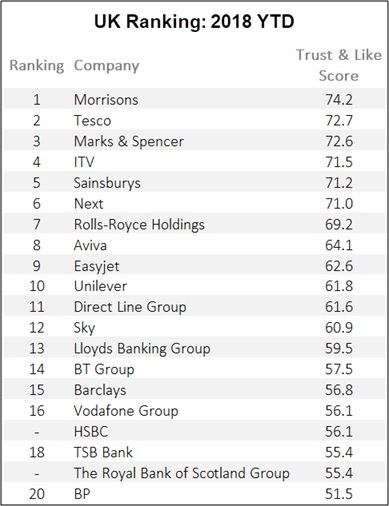 It also ranks second lowest only to BP across all major UK companies measured (see table). Unsurprisingly, consumer behaviour towards TSB has changed as a result of the crisis; likelihood to consider, recommend or speak positively about the brand all rate 25% or less. Reputation of selected UK companies, year to date. Source: Caliber brand & reputation tracker 2018. So, where next for TSB? The first step to reputation recovery has to be ‘stopping the rot’. The bank is hugely limited in its recovery plan as long as the IT issues remain unresolved. The crisis has parallels with Heathrow Terminal 5’s launch issues in 2008, resulting in a reputation crisis for both the airport and for British Airways. Once the delays died down, BA was able to successfully communicate ‘Terminal 5 is working’ through a fact-based and quick turnaround ad campaign that re-established public trust in the airport. Without addressing their IT and security demons head-on, TSB is likely to face a long-term, systemic association with this crisis which will compromise its prospects for business growth. The time is now for the brand to re-discover the bravery behind its challenger status, admit its shortcomings and ensure its reputation for competency is never risked again. The original version of this article has been published by Management Today.